Feel classy in the in the Nodykka evening clutch cross body shoulder bags clutches for women. This stylish and cool single strap crossbody handbags purse is made of high quality and soft satin material with pleated and metal detail. It features one roomy main compartment to fit your essentials for daily, weekend, formal, wedding or travel use, like cell phone, passport, keys, cosmetic bag, sunglasses, pen, lipstick, glove, card holder, coin pouch etc. Ladies purse and handbags made of high quality satin fabric material with metal accent. 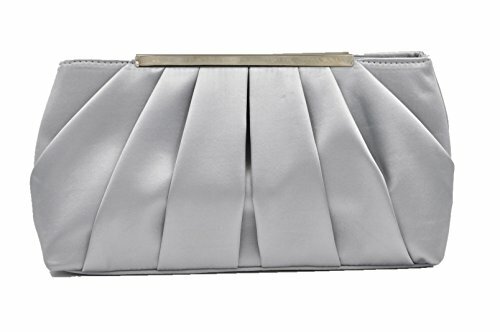 Evening clutch for women with magnetic closure. Adjustable and removable long strap for shoulder or crossbody wear. Roomy main compartment and zipper interior pocket for your daily essentials(Size:11.4*5.9*2.8 inch).